incorporates an Intel® Celeron® Processor and HD graphics card offering dual display output capability with up to 1080P@ 60fps resolution. 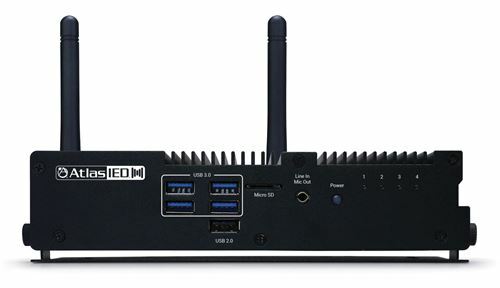 Connection to the dual display devices can be achieved via the two HDMI connections. The same HDMI ports also provide audio from 2-channel stereo up to 7.1 surround channels. 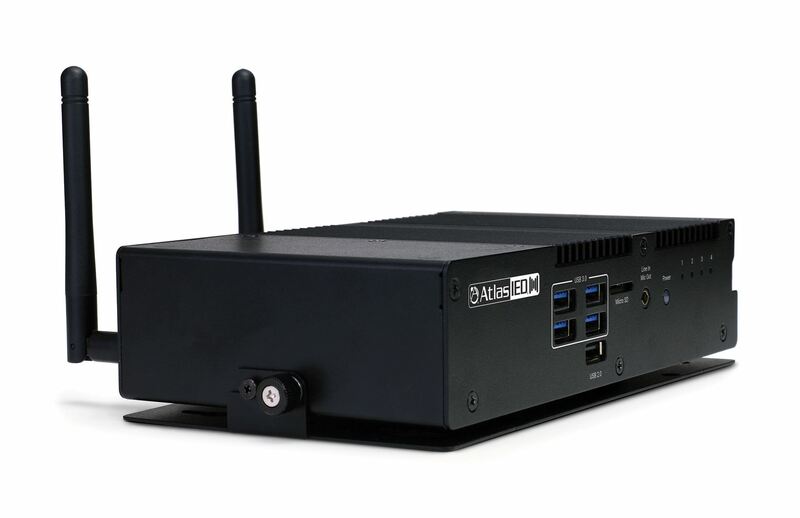 The 4WPLAYER2 connects to the network via redundant dual RJ-45 Ethernet ports or Wi-Fi 802.11ac connection. The unit has a 500GB storage drive and up to 8 GB memory. Each 4WPLAYER2 includes the GDS-4W™ Client Application that runs as a background service in the players operating system with setup easily done within the GDS-4W™ Server Application. The player receives content from the server, stores locally onto the device, and automatically displays the generated media to the connected video displays. Storing the content locally onto each 4WPLAYER2 provides media to still be displayed even in the event of local area network failure or disconnection. The 4WPLAYER2 provides a secure installation through a VESA / wall mount plate mount and Kensington lock option. A simple installation is achieved through a steady data stream via integrated gigabit Ethernet, onboard HDMI and VGA ports providing smooth HD video playback for a true plug and play experience. The 4WPLAYER2 with GDS-4W™ Client Application provides enterprisegrade digital signage to a GLOBALCOM.IP system. With GDS-4W™, facilities can visually engage customers, employees, and visitors across displays and mobile devices throughout a building.